This week's challenge is based on the love language of Words of Affirmation. In 2 Chronicles 30, the Levites (assistants to the Jewish Priests), held a week-long feast for the people of Israel. Adam Clark's commentary says, "On such occasions the priests and Levites had great fatigue, and suffered many privations." Because of this, they were in need of encouragement. 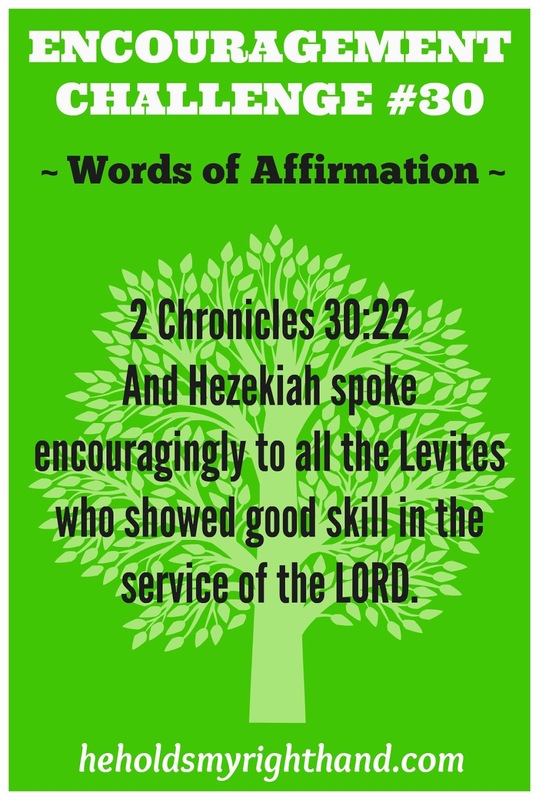 So, in verse 22, we see that King Hezekiah spoke encouragingly to them. He encouraged them to be cheerful and diligent in their service for the Lord. In other words, he spoke to them with "words of affirmation," which is what helped them to continue on with their work. Each day this week, follow the example of King Hezekiah and write (or verbalize) at least one encouraging comment to someone who comes to your mind. Don't just tell them you are thinking of them, or that you love them. Those words are nice, but the idea of "words of affirmation" is to get more specific. Share with the person what you like about them. 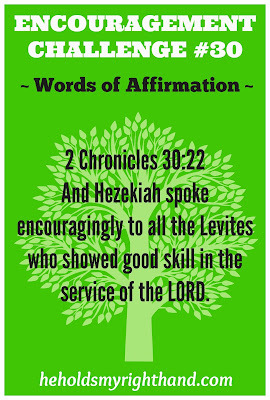 Acknowledge their good qualities, and encourage them to use their gifts and talents for the Lord.